Application of Olive oil gives good results in psoriatic patients. Coconut oil application is also great for use. Application of a paste form of oats made by mixing oats in sufficient quantity of water is also very beneficial. Use of turmeric is very useful both orally as well as for local application on the psoriatic plaque. Drink plenty of plain water is useful. Avoid using perfumes and deodorants directly over the skin. Application of Lactic acid based moisturizers help in relieving the condition. Avoid smoking, alcohol intake, smoking and tobacco chewing. Avoid junk and fried food, try and consume simple homemade food with minimum oils and maximum nutrition. Include a lot of fresh green vegetables and salads in diet to keep the digestive system in shape. Consume foods that are rich in antioxidants like citrus fruits, blueberries, blackberries, almonds etc. Sit in direct sunlight for some time every day (10 – 15 mins) preferably in the morning or in the evening. Prevent any kind of irritation of the affected areas due to any external stimulus like, very strong winds, abrasions etc. You can keep the area covered for protecting it. Practice a few breathing exercises in the morning like Pranayama, Kapal bhati, Bhasrika, Anuloma, Viloma etc. 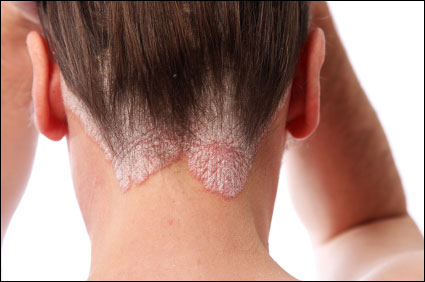 Avoid stress as it is one of the precipitating factors for psoriasis. Watch your weight if you are obese, it is also one of the precipitating factors for psoriasis.